Was I all grown up by 1982? I never had another Atari home console until the Jaguar came out. Life can do some pretty strange things to people. A decade later I'd be tracking down a 5200 of my own. I wound up with a 2-port, 4-port and a replacement board. That 8-bit wonder just kept getting better. I discovered Best Electronics with a buddy and quickly became immersed in the 8-bit games I adored. Childhood was again upon me, but this time I had disposable income. The 5200 was based on Atari Inc.'s existing 400/800 computers and the internal hardware was almost identical, although software was not directly compatible between the two systems. A number of design flaws had a serious impact on usability, and the system is generally considered to have performed poorly on the market. The system's Atari 400-based origins made for a powerful, proven design which Atari Inc. could quickly bring to market. 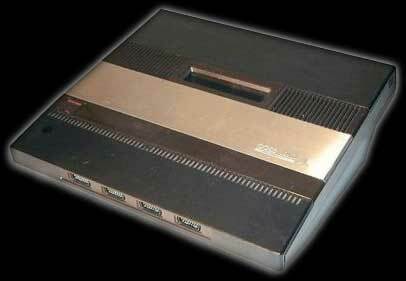 In its prototype stage, the Atari 5200 was originally called the "Atari Video System X - Advanced Video Computer System", and was codenamed "Pam" after a female employee at Atari Inc. It is also rumored that PAM actually stood for "Personal Arcade Machine", as the majority of games for the system ended up being arcade conversions. Actual working Atari Video System X machines, whose hardware is 100% identical to the Atari 5200 do exist, but they are extremely rare. The initial 1982 release of the system featured four controller ports, where nearly all other systems of the day had only two ports. The 5200 also featured a revolutionary new controller with an analog joystick, numeric keypad, two fire buttons on both sides of the controller and game function keys for Start, Pause, and Reset. The 5200 also featured the innovation of the first automatic TV switchbox, allowing it to automatically switch from regular TV viewing to the game system signal when the system was activated. Previous RF adapters required the user to slide a switch on the adapter by hand. This unique RF box was also where the power supply connected in a unique dual power/television signal setup similar to the RCA Studio II's. A single cable coming out of the 5200 plugged into the switch box and was used for both electricity and the television signal. The 1983 revision of the Atari 5200 has two controller ports instead of four, and a change back to the more conventional separate power supply and standard non-autoswitching RF switch. It also has changes in the cartridge port address lines to allow for the Atari 2600 adapter released that year. While the adapter was only made to work on the two-port version, modifications can be made to the four-port to make it line-compatible. In fact, towards the end of the four-port model's production run, there were a limited number of consoles produced which included these modifications. These consoles can be identified by an asterisk in their serial number. The controller prototypes used in the electrical development lab used a yoke and gimbal mechanism that came from an RC airplane controller kit. This simple design gave very nice smooth linear control and was highly reliable. The production controllers were quite different and a great disappointment to the electrical and software development teams. The design of the analog joystick, which used a weak rubber boot rather than springs to provide centering, proved to be ungainly and unreliable. They ultimately alienated consumers and quickly became the Achilles' heel of the system due to their combination of an overly complex mechanical design with a very low-cost internal flex circuit system. Another major flaw of the controllers was that the design did not translate into a linear acceleration from the center through the arc of the stick travel. This made control awkward. The controller also had a tendency to lock up. Fixing the lock up required the mechanics to be very loose fitting which gave the controller generally a sloppy feel. The controllers did, however, include a pause button, a novelty at the time that would become standard on almost all future game systems. Various third party replacement joysticks were also released, including those made by Wico. Atari Inc. released the Pro-Line Trak-Ball controller for the system, which was used primarily for gaming titles such as Centipede or Defender. A paddle controller and an updated self-centering version of the original controller were also in development, but never made it to market. The primary controller was ranked the 10th worst video game controller by IGN editor Craig Harris. Although the Atari 5200's internal design was extensively based on that of the 400/800 home computers, the differences were sufficient that games designed for one would not run directly on the other. The 400/800's 10 KB operating system was replaced with a simpler 2 KB BIOS, of which 1 KB is the built-in character set. A number of important registers, such as those of the GTIA and POKEY chips appear at different memory locations. The purpose of some registers changed slightly on the 5200. The 5200's analog joysticks required different input handling to the traditional digital joystick input on the 400/800. (However, the 5200 reassigned/rewired two of the 400/800's existing analog paddle registers for each bi-directional analog joystick input). Atari Corp.'s later XE Games System revisited the idea of a console based on the 400/800 hardware. However, as this was essentially just a 65XE computer with a detachable keyboard, it was able to run most of the home computer titles directly. The Atari 5200 suffered from its software incompatibility with the Atari 2600, although an adapter was later released in 1983 allowing it to play all Atari 2600 games, using the more reliable controllers native to that system. Another problem was the lack of attention that Atari Inc. gave to the console; most of its resources went to the already oversaturated Atari 2600. It faced an uphill battle competing with the ColecoVision's head start and a faltering video game market. At one point during the 5200's lifespan, Atari Inc. planned on developing a smaller cost-reduced version of the Atari 5200, which would have gotten rid of the controller storage bin. Code-named the "Atari 5100" (a.k.a. "Atari 5200 Jr."), only a few fully-working prototype Atari 5100s were made before the project was canceled. On May 21, 1984, during a press conference at which the Atari 7800 was introduced, company executives revealed that the 5200 had been discontinued. Total sales of the 5200 were reportedly in excess of 1 million units. CPU: Custom MOS 6502C @ 1.79 MHz (not a 65c02). Maximum Screen Resolution: 320×192 resolution, 16 (out of 256) on-screen colors per scan line. Palette can be changed at every scan line using ANTIC display list interrupts, allowing all 256 colors to be displayed at once. Physical Size: 13" x 15" x 4.25"